Such a lovely piece, also Sarah`s Jewel of the Order necklace is great. This necklace is absolutely to die for! I'm in love! We are blessed that you and we never sleep are so generous to put this giveaway on! Just started following wenvrsleep on instagram - looking forward to sarah's creations-in-progress, and the cats. The mega tassle necklace is just beautiful, thanks for posting! katsimonds@gmail.com, @calamitykatsimonds (instagram). Thanks for your generosity, love. i visited the etsy, her jewelry is beautiful...fits perfectly into my girly/flowery/dreamy aesthetic. So lovely! I also love the Second Anniversary Sodalite Mega Tassel Necklace. What a gorgeous statement necklace! The tassle is killer. p.s where did you get that eye ring? I need it! Such a good necklaces! Love it. Oh god I love everything she does! Aventurine mega tassel might be my fave. Could I pull it off? I think so? I hope so? I definitely follow her on instagram. Definitely will also be following her Instagram to stay updated about her work. That necklace is absolutely stunning! I've been coveting one for ages! So lovely. That is a truly beautiful necklace!! I have an affinity to rose quartz. I have been coveting this necklace since I saw it at local boutique Myrtle here in LA. So gorgeous. I love how lush the metal tassel feels in real life. I follow on Instagram and Etsy as well. her jewelry is so, so beautiful! I actually like this tassel necklace the best! Plus my ears arn't pierced so that narrowed it down a little! wow, her jewelry is absolutely stunning...L O V E! I've been wanting one of Sarah's pieces for so long! Poverty be damned! i absolutely love the color combination of the rose and brass! i followed her on instagram as well and have been admiring her cat photos which make me desperately miss my own kitty. Ahhh just loving the length and details of this piece! Would go so well with all my simple 90s maxi dresses. <3 <3 Following on Instagram, too! Oh wow this work is beautiful. I love jewellery that incorporates your body's movement as you wear it. The double tassel earrings are doing me in, too. This is really lovely. Followed on instagram also! I love love this necklace. I too have the Jewel of the Order necklace and wear it a lot. It is one of my favorite pieces. I follow her on Instagram already. Thanks so much for the chance. P.S. i love the yoga post you wrote and am dying to get that mat and natural dye pieces. What a great giveaway! I've been following We Never Sleep for some time now, but still don't own a piece! Sarah's work is amazing. I own two other pieces of her jewelry. Both earrings. Would love to own a necklace! This one is a great statement piece and would go with so many different outfits! Love Sarah's work, and this necklace is to die for! What lovely work! Checked out the shop & followed on Insta. Ahh, the the pink, the gold, the tassle; right up my alley! what a great shop! really cool jewelry. that necklace is incredible. love tassels in general but this blows my mind. started following wenvrsleep on IG. So beautiful! The Second Anniversary aventurine tassel necklace is super lovely as well. following both your ig's and checked out the site! I love Sarah's jewelry and actually own three necklaces. The other day I almost broke down and bought a pair of rose quartz Shriner's Fez earrings, so winning this piece would be great! My email address is storiesblog at yahoo dot com. And I already follow Sarah on Instagram. (Her cat is such a beauty!) storiesblog at yahoo dot com. Okay, even if I don't win this beauty, the penny saving begins NOW to get me one of these babies! Checked out the etsy shop. So many beautiful pieces! I have visited her shop many times on etsy and have favorited many of her lovely creations! I am also following her Instagram! Love her work and would love love loveee to own this gorgeous necklace! What a beautiful piece! It reminds me of Tarot. I have added & visited & here is my little comment. so beautiful! and perfect for summer. i love the combination of the hoop and tassel. Oh gosh this is beautiful! And yeah, spam has been bananas lately on blogger sites. The Shriner's Fez Mini earrings in aventurine have caught my eye (as well as this necklace of course) and I am now following Sarah on instagram, because hooray, cats! I bought the Shriner Fez necklace for a friend and barely managed not to keep it...I've been coveting Sarah's work for so long. How stunning! I am following her instagram too. So beautiful! Just visited the shop and am following on instagram. Love her work, the etsy shop and instagram. Wow love love love!! I checked out her shop and I'm also in love with the second anniversary necklace. Oh, what a beauty! I noticed the necklace in your Grove Festival post and fell in love with it instantly. Just hit the follow bottom on Sarah's Instagram. Ah, it would be wonderful to win. so lovely...and thank you for the giveaway! OK, that necklace is way too beautiful. I've been on the hunt for some new accessories, but haven't really seen anything that I can get excited about. Now I know exactly what I want. Love love love. I followed on instagram too. Love your blog, I would love to enter to win that gorgeous piece made by Sarah. I followed her on Instagram too!! Thanks so much! Love your blog. I followed on instagram as well (username _catparty). So in love with her pieces. I also just followed @wenversleep on instagram! love love love everything in the shop! absolutely absolutely gorgeous. Who would've thunk art history + jewelry? What interesting jewelry! Thank-you for such a good giveaway, I have my fingers crossed! I don't have instagram unfortunately :(, but I just checked out her etsy shop. I love the Hematite neclace too! really lovely work; following on instagram and loving the catz. Crazily in love with this necklace! WeNvrSleep is one of the favourite Etsy stores I've been looking at, love her innovative way of constructing all these gorgeous, timeless pieces. This sounds like the best giveaway I could be hoping for, if the lucky feather would ever land on my shoulder. Forgot to mention, I've been following you and Sarah on Instagram (that's how I know about this giveaway). You girls are amazing. Checked out her shop--and am now thinking seriously of buying one of the necklaces if I don't win!! And also followed her on Instagram. Her jewelry is so beautiful. 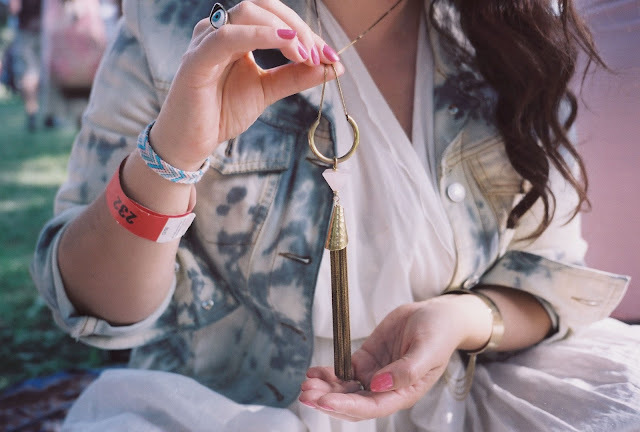 That necklace would be all you'd need to wear with basics, to make a really interesting outfit. Love this stuff. So much so that I followed Sarah on instagram as well. Thanks for the giveaway. I visited the we never sleep Etsy shop! Thank you for the opportunity! She has such a great shop - I love the styling with the cacti. Already follow her on instagram! omg her stuff is amazing! I love the rose quartz shriner's earings/ may have to get them! I'm also following her on instagram!!! This necklace is the most, to say the least. Checked out the store, love all the different stones it comes in, and following on instagram now too. Oh my word, this is gorgeous. Sarah honestly creates some of the most beautiful jewellery I've seen. I'm exactly the same as you, I'm very picky about jewellery pieces I buy but this is stunning. I've bookmarked her shop and I'm following her on instagram. Beautiful. This is so beautiful in addition to all of her other work, wow! Also followed on instagram! Even more hidden beauty! Basically, Sarah makes the dreamiest jewels! I also have some of her pieces, and they are among my favourites! Just wore my Shriners Fez, today :). I've been a follower of hers on etsy and instagram for some time now. Some amazing creations, this one in particular is one of my favourites. I love the bronze colour and texture. I just followed her via Instagram as well (my Instagram is emdicker), and my email is emdicker@hotmail.com. I love how you've captured Sarah's piece! Oh man, I have been coveting one of these beauties for a while now. Her shop is just lovely. I also follow Sarah on Instagram. This necklace is super beautiful! The whole etsy shop is lovely too, really gorgeous and unique pieces! I've followed on instagram too. what an amazing piece! I've been coveting her jewelry for a while now. I'd love to own a piece! Possibly one of the coolest necklaces I've seen in a long time. I love the rose quartz. I also love the white quartz version in her shop. Rose quartz + Tassel = Impossible Beautiful! happily following her on Instagram! I love the tassel necklaces. I LOVE all things aventurine... so i love her aventurine necklace in her shop. 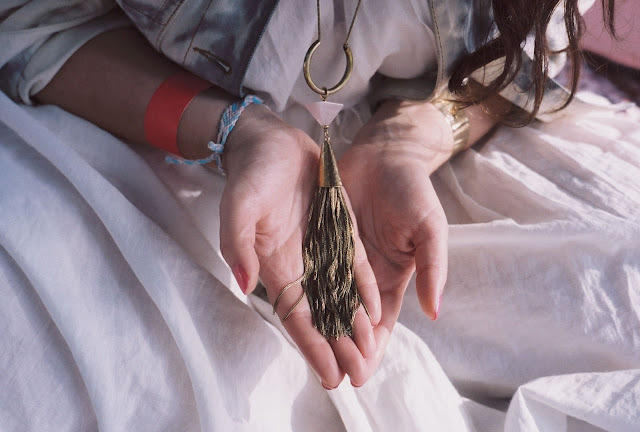 love the brass tassle, and would love to win this giveaway! I also follow her on instagram! No surprise there are a billion comments already...I'll still enter too! And I followed her on instagram. love Sarah's work! Already following on instagram. Rose quartz for a witchy womannnn. Ooh wee beauty. That lady knows how to make a mean tassel. Lovely photos! The vintage look complements very well the rose colour of the quartz! followed Sarah on Instagram! what a dreamy page :)and what gorgeous pieces! I'm such a quartz junkie; I love it all. I have admired Sarah's jewelry for ages! It's so unique and doesn't just look like every other necklace out there. And am following her on instagram. Oh wow, her stuff is so lovely. The tassel earrings are fantastic as well! So, so lovely...I could use a bit more pink! Rather than leave an email (spam! ), could you contact me via Etsy (Ottoman) if I were lucky enough to win? I need to add how much I love the shots of the pieces too. They look SO NICE on the greenery! I adore the rose quartz stone and lovely necklace. I also visited her Etsy shop and covet her rose quartz tassel earrings, so lovely! Followed her on Instagram, as well. Love this, and subsequently followed in Instagram. that is a killer necklace! i'd already added the shop to my etsy faves, and i've followed her on insta! i love this necklace so much. the shriner's fez mini tassel earrings are lovely as well. I follow Sarah on instagram. thanks for the giveaway! Oh dear lord. 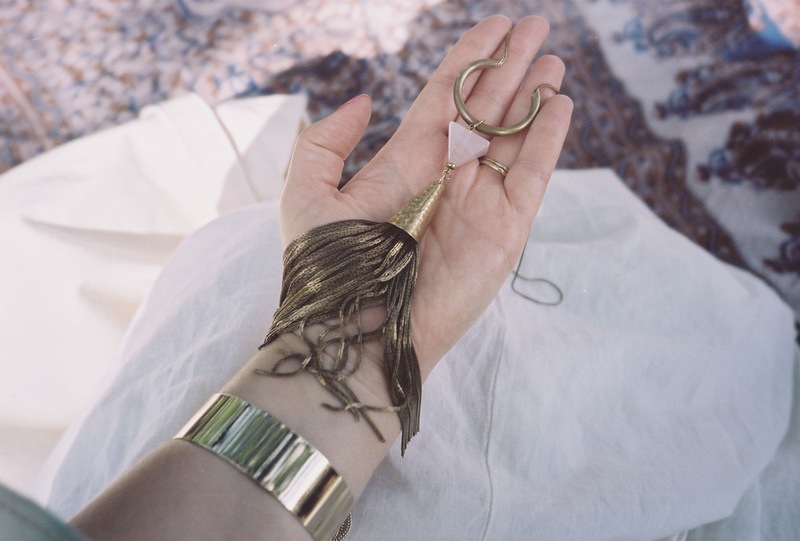 Rose quartz + bronze tassels are a match made in Heaven. I've visited Sarah's shop and follow her on insty now! My little fingers are crossed! beautiful! Oh, I'd love this necklace! I already know exactly what to wear with it. Could totally buy half the stuff in her shop - in a world without a currency other than adoration that is. This is so gorgeous, big fan of her other stuff too! oh my goodness, yes! I would love to have this, please! It's the perfect accessory for adding interest to a wardrobe filled with basics. Gorgeous pieces in this shop! Lovely, lovely piece. Would love to have it join my little collection! What a beautiful piece, I love rose quartz! I really love the earrings on the etsy shop too, what a great designer. I've just followed her on Instagram too - I love all her adorable cat pictures. Beautiful piece! Just started following her on instagram.. instant lady crush! That necklace is stunning! I hope I can give it a nice home around my neck (fingers crossed). Thanks for hosting such a great giveaway! What a gorgeous shop!! Thanks for hosting! I love tassels! Thank you! So pretty! Following her on instagram. love this necklace, and all the gorgeous earrings in the etsy shop too! Oh man, these are so LOVELY! My fav is the Second Anniversary White Quartz Mega Tassel Necklace. Love all her work had never seen Aventurine until looking at her work.